« Sheesh! Stop Complaining! Nothing Is Perfect! You know what the best thing about guitar gear is? There’s lots of it! You know what’s the worst thing about guitar gear? There’s lots of it! So much so, that it makes it difficult to make a decision on just what to get. Let’s talk about amps! There are so many to choose from that it’s difficult to make a decision. For me, I’m looking for a new amp with lots of clean headroom and a shimmery top-end to play reggae and be a pedal platform for the classic rock cover band I’m in. For those in the know, they’ll automatically think Fender for that kind of clean tone. There is something absolutely magical about that Fender clean tone. It’s truly unique. And, in fact, I’ve been thinking heavily about investing in a Fender Twin Reverb. But truth be told, I have to face it: The barrier to entry for me, at least financially, is pretty thick at the moment, so I have to look to less expensive alternatives. And that’s where the problem lays. 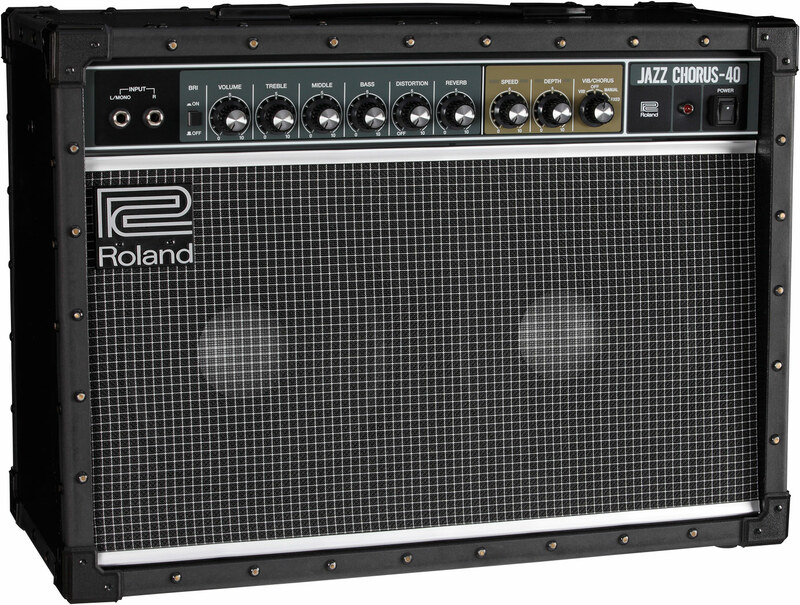 Whereas I love that Fender clean tone, I completely forgot how much I loved the original Roland JC 120 clean tone. It’s completely different from a Fender clean, but it’s still an incredible and unique tone that stands on its own. Recently, I played one of my band mates’ Fender Ultra Chorus and absolutely loved the delicious and lush cleans that amp produced. I wrote an article about the experience because I was so blown away by how great the amp sounded. I was actually ready to pull the trigger on a used Ultra Chorus last week, but then I ran across the Roland JC 40. Oy-vay!!! Talk about having the tonal mojo of its bigger brother, but only weighing in at 34 lbs.! Plus, there’s absolutely NOTHING like a JC-Chorus tone live. Sure, there are GREAT chorus pedals out there, and I own a few of them. But once you hear how a chorus sounds out of a two-speaker setup with one dry and one wet speaker, then your whole perspective changes on chorus. The thing about the JC 120 was that with the chorus engaged, the sound was extraordinarily three-dimensional. It’s hard to explain. And now apparently, the JC 40 offers the same “JC Clean” mojo but in a smaller, lighter form factor. Now I know that there will be those that eschew amps like this because they’re solid state. But for me, an amp like this serves one purpose: Give me a clean platform with TONS of headroom to which I can add pedals to shape my sound. I don’t need a tube amp for this. Besides, I’ve set up all my tube amps to break up early, and since they’re pretty low wattage/low gain, I don’t have much clean headroom. That said, my DV Mark Little 40 and Aracom VRX22 definitely have enough volume to play clean, but these cleans are “Marshallesque,” which are gorgeous, but are much more smooth and don’t have the “shimmer” of a Fender or JC clean tone. And for the reggae that I’m starting to play, I need a bit more of an edgier clean tone. So, enter the two amps above. They’re purely clean, though they have a distortion effect built in, but I doubt I’d ever use that feature. Both have a chorus effect, of course, and while I prefer the Roland chorus, the chorus effect on the Fender Ultra Chorus is pretty nice, though a bit warmer sounding than the Roland chorus. It’s a tough decision. 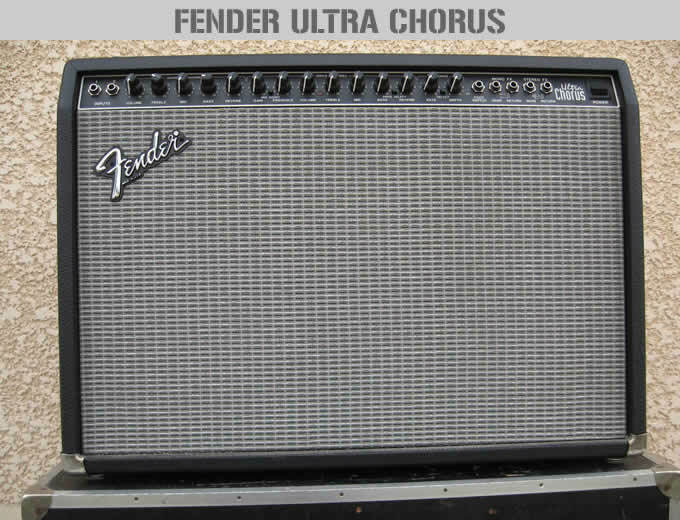 Fender no longer makes the Ultra Chorus, but I could get one for under $300. The JC 40 runs from $549 to $599, but it’s a modern amp with truly modern solid state components. To be honest, I’m leaning towards the JC 40. It’s twice the price, but it sure does look cool. Here’s a great 2-part demo of the JC 40 done by Music Bliss Malaysia. To me, this is just about the best demo I’ve seen of this amp, and one of the best demos I’ve seen of gear period. This dude rocks it! I don’t know the guy’s name who demos for Music Bliss Malaysia – and I can’t seem to find his identity at all – but I love the fact that he demos a myriad of styles in his demos, and this particular set of demos shows off the amp’s capabilities quite nicely. It’s nice to see a demo which isn’t just blues chords and licks. Not that I have anything against blues, but when demos are only done with only a single style, it feels a bit one-dimensional. In any case, the more I write this article, the more I’m leaning towards the JC 40. While I love the Ultra Chorus, I have a history with the “JC Clean” sound, and I love it. And to address even considering a solid state amp, for me, I’m a disciple of the Duke Ellington school of thought: If it sounds good, it is good. It doesn’t matter to me what materials go into a piece of gear, just so long as it gives me the sound I want, and can also stand being transported and work in my studio. The challenge, of course, is that I’ve chosen my pedals -especially my overdrive pedals – specifically because they sound great and interact well with the front-end of my tube amps. With these solid state amps, that’s not an option. Though the distortionLuckily I’ve never gotten rid of the pedals I’ve purchased that don’t work. Hopefully, I’ll be able to take those out of mothballs and find one or two that work well.